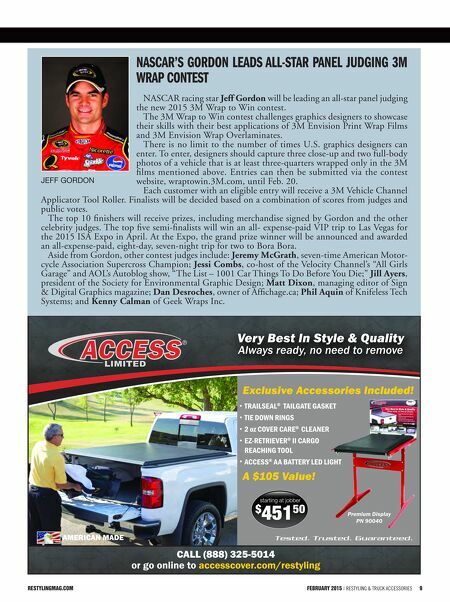 8 Restyling & tRuck AccessoRies | FEBRUARY 2015 restylingmag.com PeoPle AAMP of AMericA NAMes New PresideNt AAMP of America, Clearwater, Fla., has appointed David A. Klatt Jr., as president and CEO. Former CEO, Ron Freeman, has been elevated to com- pany chairman and now will focus on acquisitions, strategic partnerships and new channel development. "I am very excited to join AAMP of America and partner with Ron to help realize the full potential of this organization," Klatt said. "Ron's 27 years of automotive industry knowledge, experiences and reputation will be invaluable to me. AAMP's culture of service, the potential for global and adjacent category growth, topped by the strong support from the Audax management team were the major drivers behind my decision to join the team. I see tremendous future growth for AAMP in connectivity, convenience and safety." Klatt will work from AAMP of America's headquarters in Clearwater. He joins the company after working in consumer products and electronics for the past 28 years. He most recently served as president of Newell Rubbermaid's global writing segment, which consists of brands such as Sharpie, Paper Mate, Expo and Dymo printers. "I am pleased to have David joining AAMP of America and welcome his vast experience in consumer markets," said Freeman. "AAMP's future growth depends upon our global growth strategy and David is the ideal leader to guide us in developing and executing against those expansion plans." Jl Audio APPoiNts trAiNiNg sPeciAlist JL Audio, Miramar, Fla., has appointed Robert Haynes as product trainer. Hayes will support JL Audio's home, mobile, and marine audio dealers and independent sales rep organizations. Haynes previously worked with Rydeen Mobile Electronics where he developed dealer training and social media marketing programs for dealers, according to JL Audio. "I am really excited to have Rob join our training team. His retail background and experience as a product trainer make him a great addition to JL Audio," said Steve Turrisi, director of training and technical services for JL Audio. "Together, Rob and I will create and deliver relevant and helpful presentations as well as informative videos to support our products. We will also create content that can help strengthen our business partners in terms of technical competence, sales abilities and merchandising." 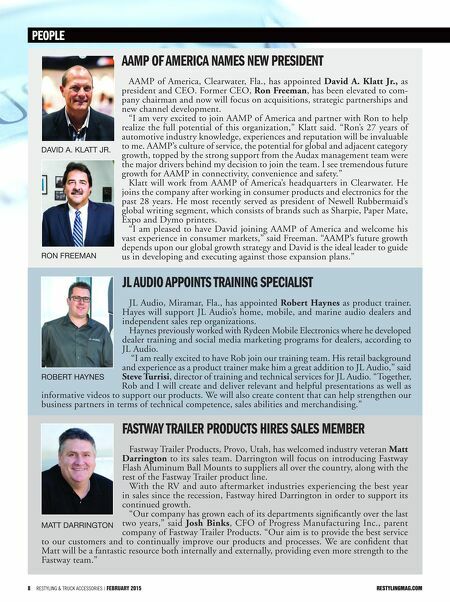 REstYlingmAg.com ROBERT HAYNES DAVID A. KLATT JR. RON FREEMAN MATT DARRINGTON fAstwAy trAiler Products Hires sAles MeMber Fastway Trailer Products, Provo, Utah, has welcomed industry veteran Matt Darrington to its sales team. Darrington will focus on introducing Fastway Flash Aluminum Ball Mounts to suppliers all over the country, along with the rest of the Fastway Trailer product line. With the RV and auto aftermarket industries experiencing the best year in sales since the recession, Fastway hired Darrington in order to support its continued growth. "Our company has grown each of its departments significantly over the last two years," said Josh Binks, CFO of Progress Manufacturing Inc., parent company of Fastway Trailer Products. "Our aim is to provide the best service to our customers and to continually improve our products and processes. We are confident that Matt will be a fantastic resource both internally and externally, providing even more strength to the Fastway team."